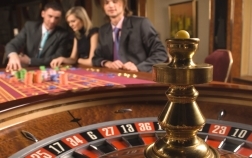 You don't need to be an expert to notice that a roulette table is disposed in such a way to enable six or even eight players to try their luck in one game. One seducing element is the wheel in the center of the table. As for the dealer, alias the croupier, he is the most important figure standing close to the table, monitoring the gambling. Each round of betting requires the announcement of the numbers and the spinning of the ball. All of these are the croupier's responsibility. The standard table either American and European consists of two sides, with two fields, namely: the inner and the outer field. When checking out the wheel, you will see definite numbers, all being displayed in the lower field. In this internal area, the numbers follow in order, from the lowest to the highest one. An exception from this order is the number one. It is required to occupy an upper position on the left. Your play will be easy, if you follow the first three numbers placed on the first row. In the second row, you will find numbers four, five and six. The numbers follow systematically up to thirty six. In its collective layout, the table contains 3 columns. If you play the European, mostly French, roulette, you will see a single 0 in the green roulette betting area, which is placed in the first row on the highest position. The zero is doubled in the American layout. When the croupier asks the players to make their so called internal bet, he refers to wagers made on the inner field. You should simply consider the position of the chips you have, and do a single gamble on any of the numbers ranging from one to six. Further on, you can see an external area ranging the numbers in a particular way. The external wagers are placed under the row thirty four to thirty six and go to the lowest part of the table. There are three bets in this field. The first one is to be found beneath every column, allowing the betting on the numbers. You can also bet in the space right in front of the dealer. Here the wagering will be done one after the other, row number 1 and 3 being the main characters. Payouts mean red or black sections and odds. Here, a bet can be placed on the best set, considering the numbers one to eighteen or nineteen to thirty six. Before coming to an end, know that the wheel and the table lack any memory, hence winning is all up to you! Good luck!